Was Paul’s “Philosophical” Speech at Mars Hill in Athens a Failure? In Acts 17:16-34, we read about Paul’s appearance before the Athenian philosophers at the Areopagus. In verses 22-31, Paul makes a speech before the crowd, before being mocked and cut off in mid-argument (verse 32). Some Christians believe Paul later came to regret this speech, as too “philosophical,” a rhetorical style ill-suited for Gospel presentation. In other words, what Paul argued before the Athenians was a mistake, an example for us today of what not to do when contending for the faith among non-believers. I intend to challenge that interpretation of this text as misguided. Instead, I argue that Paul’s “philosophical” speech at the Areopagus, otherwise known as “Mars Hill,” was simply yet another tool in the toolbox of the evangelist, given to us today by God as an example of how we can seek to persuade our non-believing friends of the truth of the Gospel, when the situation calls for it. Paul’s performance at Athens, far from being a failure, was a resounding success, and worthy of emulation by a follower of Christ today. 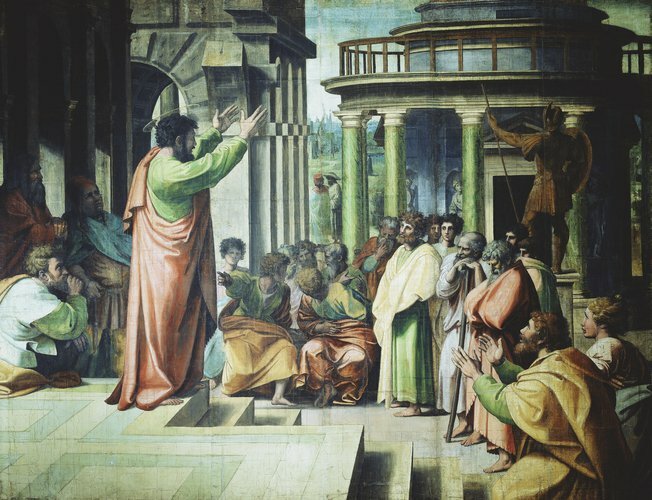 St. Paul Preaching at Athens, by Raphael (1515-6). A bit more background is in order. The Apostle Paul was disturbed that the city was “full of idols” (verse 16), but there was more to it. Ancient Athens was the seat of philosophical sophistry in the Greco-Roman world. The early church father, Tertullian, famously asked, “What has Athens to do with Jerusalem?,” suggesting that the story of the Risen Jesus, the narrative that came from Jerusalem, was quite different from the wisdom of man, that symbolized the philosophical sophistication of Athens. This is undoubtedly true. Paul himself noted that knowledge puffs up, even for Christians (1 Corinthians 8:1). Often, intellectual pride is a stumbling block for Christians, as well as being a stumbling block for the non-believer, in coming to faith in Christ. But is it ever permissible to use philosophy as part of one’s defense for the Gospel? Apparently, there are Christians who say no, believing that Paul’s speech before the Athenians was a failure. Such Christians believe that any evangelist should stick with the Bible, and avoid any style of argumentation that sounds “philosophical,” that trusts in mans’ wisdom as opposed to the wisdom of God. However, trusting in “man’s wisdom” and employing philosophical argumentation for the advancement of the Gospel are not the same thing. When Christians confuse the two together, and reject Paul’s example in Athens, as something to avoid, they rob the intellectually-inclined skeptic of the opportunity to hear the Gospel presented to them, in a language which they can understand. In Paul’s speech, he sought to persuade his listeners by contending that they were very “religious” (verse 23). He praised the Athenians for their inscription “to the unknown god,” though it surely raised more than a bit of curiosity, by his claim that the Risen Christ was that “unknown god” (verse 23). Paul appeals to the Creator, as “Lord of heaven and earth” (verse 24), a theme consistent with Scripture (Isaiah 42:5), that also echoed the philosophical thought of Plato. God “does not live in temples made by man” (verse 24) recalls Mark 14:58, but it was also a sentiment found in the thought of both his Stoic and Epicurean listeners. Paul quotes, with admiration, two of the most well known pagan poets, Epimenides of Crete and Aratus, regarding God, “In him we live and move and have our being,” and “For we are indeed his offspring,” respectively (verse 28). Paul cites these pagan thinkers to argue that we are not to worship idols, a teaching consistent with the Old Testament (Deuteronomy 5:8). 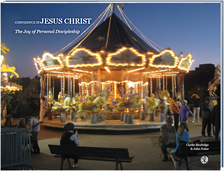 Sadly, in much of the church today, Christians have largely given up on the art of persuasion, that appeals to the intellect, of those who are philosophically inclined, like the Athenians, as a preparation to hear the Gospel. But let us examine the Scriptural evidence: On what basis do those who believe that Paul failed in Athens, make their case that Paul later came to regret the rhetorical substance of his speech before the Athenians? And I, when I came to you, brothers, did not come proclaiming to you the testimony of God with lofty speech or wisdom. For I decided to know nothing among you except Jesus Christ and him crucified. And I was with you in weakness and in fear and much trembling, and my speech and my message were not in plausible words of wisdom, but in demonstration of the Spirit and of power, so that your faith might not rest in the wisdom of men but in the power of God. (1 Corinthians 2:1-5 ESV). Did Paul write these words, with his experience in Athens on the forefront of his mind? Granted, Paul’s speech at Athens is the most “philosophically” oriented discourse we have recorded in the Book of Acts, but there are a number of problems with the viewpoint of Paul having “regret” over the Athenian episode. Some have cited the relatively poor response to the Gospel in Athens (Acts 17:32-34). True, there is no evidence in Scripture that a church was established in Athens, as a direct result of Paul’s ministry. But do not “all the angels in heaven rejoice, when even one is saved,” as the common saying goes? There were “some” who did join Paul and believed. Would not have Paul rejoiced in the fact that God did indeed move within the hearts of at least some of his Athenian listeners? The thought of new followers to the faith, though few in number, would hardly have been a good reason for Paul being anxious or discouraged, upon entering Corinth. Furthermore, Dionysius the Areopagite (v.34), one of Paul’s successes in Athens, is reported later by the church historian Eusebius to have been eventually a leader in the church at Athens, and became a martyr for the faith. So, the rumor that there was no church to come out of Paul’s preaching in Athens, should be safely dismissed. Was there any further activity by Paul in Athens? Acts simply does not say. All we know is that sometime after his appearance on Mars Hills, he left for Corinth. There is nothing here in Acts that tells us that Paul was in any way discouraged by the events in Athens. We are left with trying to figure out what Paul was trying to communicate to the Corinthians, in his first letter to them. A strong case can be made that Paul understood Corinth to be quite a different city than Athens. While Athens was a center of scholarly learning and disputation, Corinth was a port city, focused on commerce and industry. The heady, philosophical approach employed at Athens would not make much sense to the dock workers at Corinth. Instead, Paul sought to meet his listeners, whether in Athens or in Corinth, where they were at. Some scholars contend that Paul’s admission of “weakness” before the Corinthians, in 1 Corinthians 2:3, might have actually been a physical condition, as some sort of illness.5 Either way, the common, popular view that Paul’s “weakness” among the Corinthians, referring to some sort of psychological condition resulting from a sense of failure at Athens, is without foundation or evidential support. A closer examination of 1 Corinthians itself reveals that Paul was not adverse to continue quoting pagan poets and philosophers to make his points: “We see in a mirror dimly.” (1 Cor. 13:12, from Plato, “Phaedo”), and later, he quotes “Bad company ruins good morals.” (1 Cor. 15:33, from Menander’s Comedy, “Thais”). Why would Paul rightly reject “the wisdom of men,” only to contradict himself by favorably quoting pagan philosophers in the very same letter? Instead, it might be best to conclude that Paul’s apologetic efforts at Athens were not a failure, but rather a resounding success. While Paul was among the intellectual elite in Athens, he used the philosophical tools available to him, for the advancement of the Gospel. By appealing to the thoughts and sentiments of the Athenians, Paul was able to gain a more effective hearing. While among the laborers in the dockyards of Corinth, Paul used the appropriate style of rhetoric for his listeners there. Wherever Paul preached the Gospel, he did so by appealing to the backgrounds of his listening audience, tailoring the style of his message that would best suit the presentation of the Gospel. The variety of approaches to preaching and evangelizing that Paul used throughout his ministry, gives testimony that the message can be adapted in style to the particular audience, without compromising the substance of that message. To further prove the argument, in that very same letter to the Corinthians, that rightly speaks against the “wisdom of men,” Paul nevertheless contends that, “I have become all things to all people, that by all means I might save some” (I Corinthians 9:19-23). Others have followed in Paul’s footsteps over the years, in speaking before the great intellectual minds of the day: Saint Augustine wrote his City of God to challenge the mockery of the pagan intellectuals, in the waning days of the Western Roman empire, and his book has become a classic. Thomas Aquinas wrote Summa contra Gentiles to refute the great scholars of 13th century Islam. C.S. Lewis’ radio addresses on the BBC Radio, during the bleak period of World War II, that became substance of Mere Christianity, shook up the spiritual agnosticism of the British intellectual elite. Genetic scientist Frances Collins held back the assault of the New Atheists when he published The Language of God, 2006. Leading Christian thinkers today, ranging from Tim Keller to William Lane Craig, continue to “take every thought captive to obey Christ” (2 Corinthians 10:5), just as Paul did before the Athenian philosophers. …. And to think that the Apostle Paul did this all for the glory of God…. That we might learn from all of the examples of Paul that Scripture lays before us, to encourage us to be faithful witnesses for Christ!! This entry was posted on Thursday, January 17th, 2019 at 8:00 am	and tagged with Acts 17, Areopagus, Mars Hill and posted in Apostle Paul. You can follow any responses to this entry through the RSS 2.0 feed.